Ukraine plans to build a military base in the Azov Sea to counter an increasing threat from Russia, the head of Ukraine’s armed forces said. Viktor Muzhenko, Chief of the General Staff, told Reuters on Oct. 1 that Russia is building up its military presence on Ukraine’s borders and is also preventing a number of vessels from reaching Ukrainian ports through inspections and detentions. Muzhenko said a new military base is needed in the Azov Sea, a strategic arm of the Black Sea where Russia and Ukraine share the coastline, because it has become a flashpoint for Ukraine-Russia tensions this year. 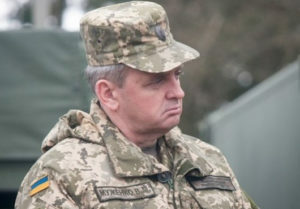 Muzhenko said Ukraine has deployed more air, land, sea and artillery forces to the area. “All those actions that are being taken in the Azov Sea region, are elements of building up our presence in this region for an adequate response to possible provocations by the Russian Federation,” Muzhenko said. The United States has called on Russia to stop “harassing” ships. The Trump administration has also supplied Ukraine with U.S. patrol boats. Moscow, which said it fears Ukraine might try to blockade Crimea, says its checks on shipping are lawful. “Russian checks on ships are intended exclusively to ensure security in the Azov Sea and Kerch Strait, they don’t contradict international law as it applies to this maritime area,” Maria Zakharova, Russia’s foreign ministry spokeswoman, told a news conference on Sept. 22. Muzhenko spoke to Reuters after the conclusion of five days of wargames across different parts of Ukraine which he said were intended to counter any chance of Russia attacking from the west. “This concerns the ability to respond adequately to threats from the Russian Federation. We are talking about protecting our communications, about a possible response to threats, including in the west,” Muzhenko said. Muzhenko said Javelin missiles supplied by the U.S. had been tested and his troops are trained to use them, but they had not been deployed in battle yet. Asked whether Ukraine wanted to buy the U.S. Patriot air defense system, Muzhenko told Reuters that various options were being considered.